Saturday, July 29 2017 — Northeast Kingdom, VT—Youngest swimmers to finish the Kingdom Swim course, the Rivard Sisters do it like real champs! Margaret Rivard (10) finished the 10 mile course in 5h50m12s and finished in 6th place in the woman’s category. When she did that, she became the youngest person to ever finish the course. She ran out of the water like a champion. All smiles and her arm felt great! So proud to see her amazing spirit and toughness! Vera Rivard (13) finished the 25k Border Buster in 7h15m33s. When she did that, she also became the youngest to ever finish this course. She ended up finishing in 3rd place overall for the women! 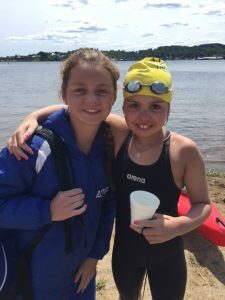 (5th overall) “It was so fun for me because I got to see her pass 3 swimmers for position in the last 1.5 +/- miles….All grown men, which she LOVED,” said her mom enthusiastically. Both Margaret and Vera swim with the UVAC swim team when they are not doing open water swimming. To find out more about the swim team click here.